I've decided on the following entry for the challenge. 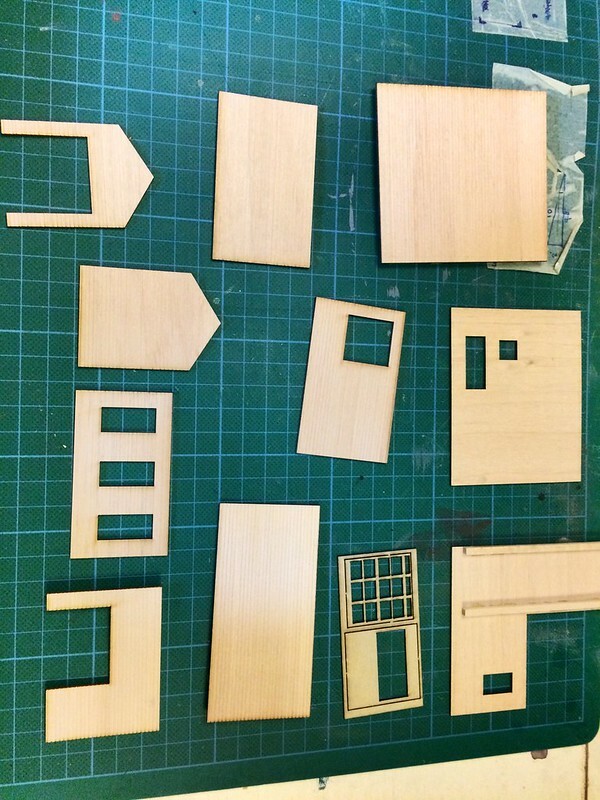 It is a laser kit structure. It's a type of structure with which I've got very little experience. 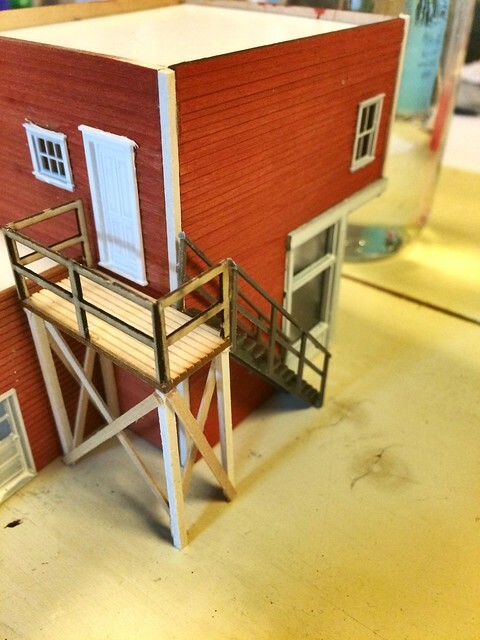 I've done a fair share of styrene and hydrocal, but wood is relatively new to me. I'm hoping this structure will not only fit my module 'Tree Point', but also provide me with some fun and learning experiences. 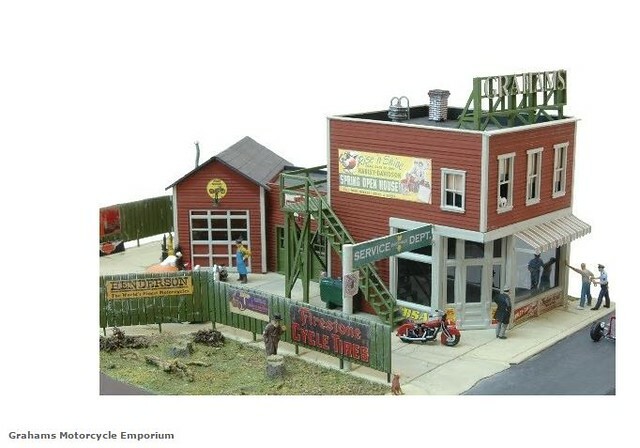 The below picture is a catalog picture, not the finished article! 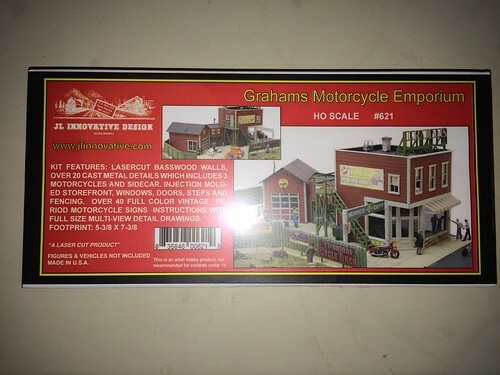 I haven't received it yet, and I won't start building until December 1st. Like a good boy, I waited with opening of the box until this evening, to see what I might find. The answer lots..
My chosen kit has a lot of small parts, but they are mostly detailing parts that I won't need right away. It also comes with a lengthy instruction sheet, as well as drawings. Finally, Christmas out of the way, and life is getting back to a little bit of normality. I have now begun the construction process finally.. The first order of business is to identify all wall sections and start cutting some corner posts in to correct lengths. I found that my earlier investment in a Northwest Shortline 'The Chopper' paid off, and I ended up with nice clean and straight cuts. I did also notice that some walls are slightly warped, but I'm hoping that a bit of bracing will straighten that out. After gluing the posts to the walls, they are now sitting on my work table, drying for the next step, which will be painting. OK, I'm finding it difficult to keep on top of the project. Truth be told I have been distracted a bit by work, busy weekends, and lack of paint. This wood structure would be best painted with a solvent based paint, even if it was a rattle can. Problem is, I don't have any of that in my work apartment where I build this to pass weekday evenings. I therefore proceeded to damp the other side of the walls, and put a weight on it and it must be said, 99% of the damage seems rectified. the 1% remaining is a wall that came out of the box already warped. I'll glue some bracing on the backside of that one to straighten it out. I'm leaving the weight on overnight to make sure it dries properly and stays in shape. In the meantime I've continued with the styrene windows and doors , removing flash as I go along and get them ready to paint. Once done, they'll get glued in their respective walls and then I can start assembling the structure. Work has again thrown me a few time consuming projects, that meant I had less time than I wanted for this build, but I managed to get a couple of minutes here and there. 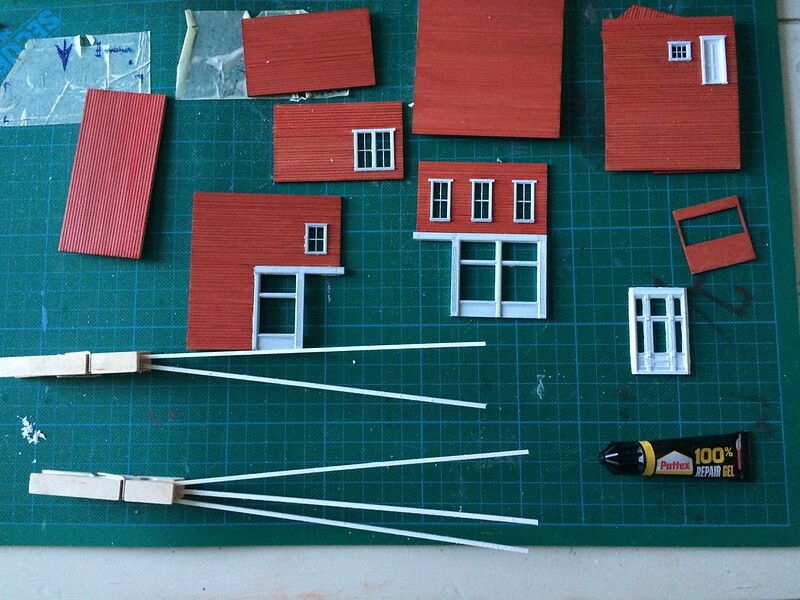 Since the last post I've continued preparing the wall sections, painted all the window frames, and painted the corner posts then cut to the right lengths . As I reported earlier, I had some challenges with warping as I used a water based artist acrylic paint for the walls. This took some time to rectify, but I managed to straighten them all out by also 'wetting' the other side, and then put them to dry with weights on top of them. The corner posts and windows where therefore spray painted with a solvent based paint, which resulted in no warping. My next wood structure will certainly not be subject to water based products anymore. 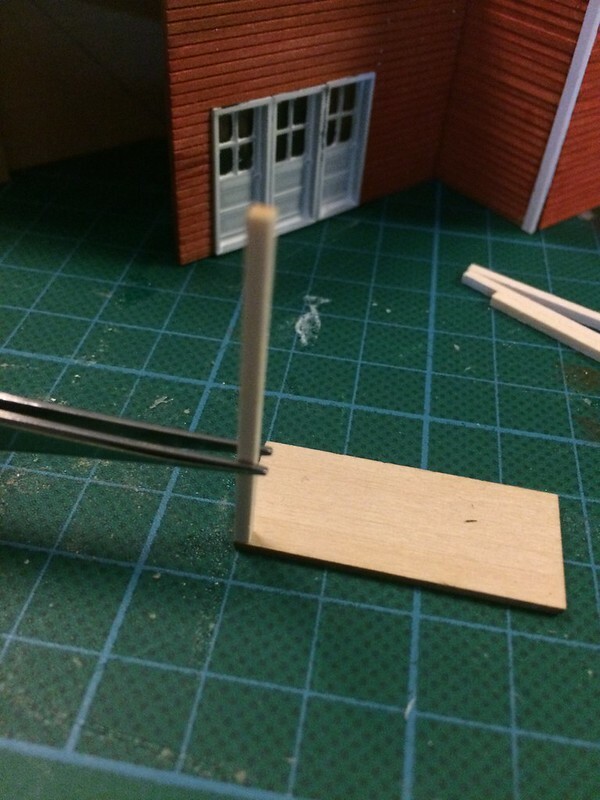 I also found that gluing a wood structure is not as straight forward as a plastic/styrene structure. I've done plastic structures in the past and one of the best things to use for that is a solvent called Methyl Ethyl Katone. It actually dissolves the plastic and it evaporates very quickly, so you can build very quick and clean too as it is very thin. For wood, and especially the bond between plastic window frames and wood, I needed something else. I found a gel type CA based glue that has about the consistency of butter, and dries pretty quick, so assembly with this was fairly painless. I do wonder what others use for this. The brand I found was Pattex 100% repair gel. I'm not sure under what name this is available in the UK, but this is a common product in the Netherlands, Germany , Belgium and France. As it was evening, I had no chance even purchasing it, and I could not find anything that I could cut it from (packaging of some description for example). So that stopped me from progressing any further this evening. 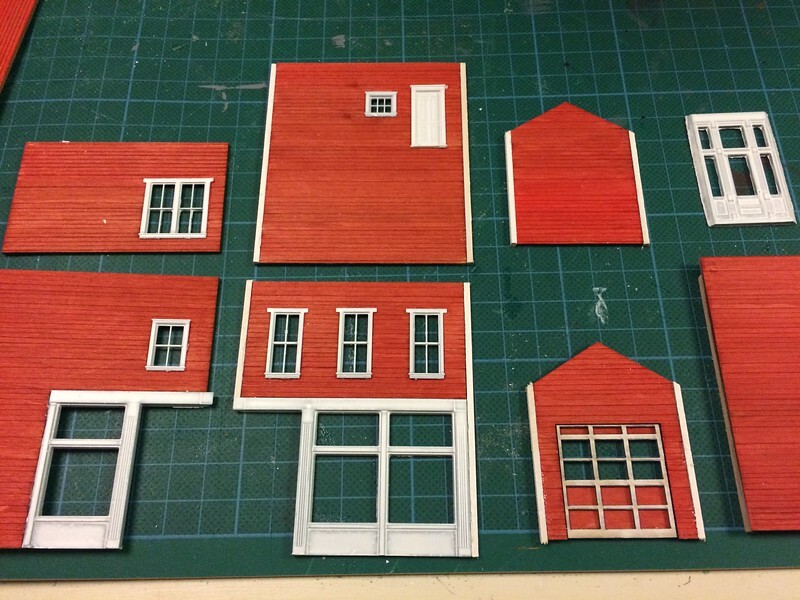 I did not want to continue assembling the structure right now, as I am afraid that adding windows would become too difficult then. Panic over, I found an ideal material/source to make window 'glass' in my office, transparent cover sheets that is used as covers to assemble publications, training booklets and similar materials etc. Two sheets of A4 size would probably be enough for me for some time to come and thus I borrowed it. 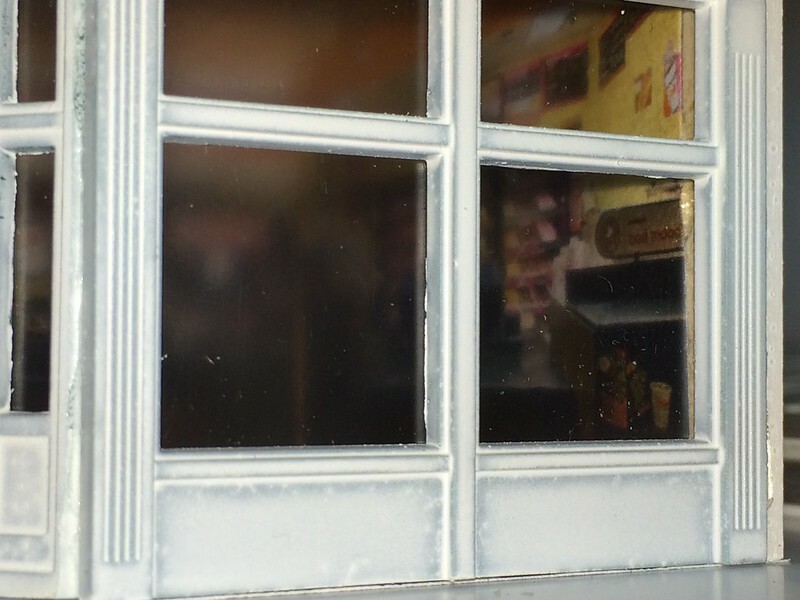 After cutting the various window glass to size, I glued them on to the windows and doors from the back, using CA glue. 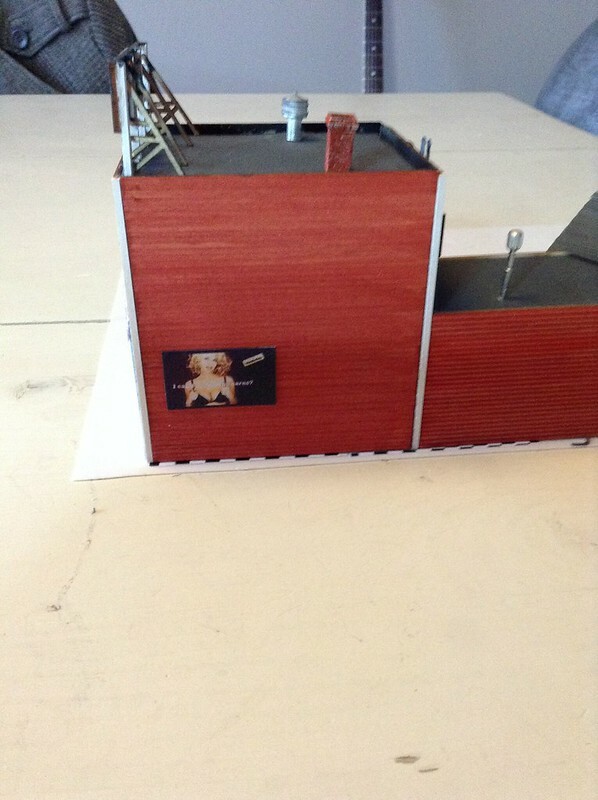 Then I continued to build up the structure by gluing the outside walls of the main building together, and then inserting the angled door. 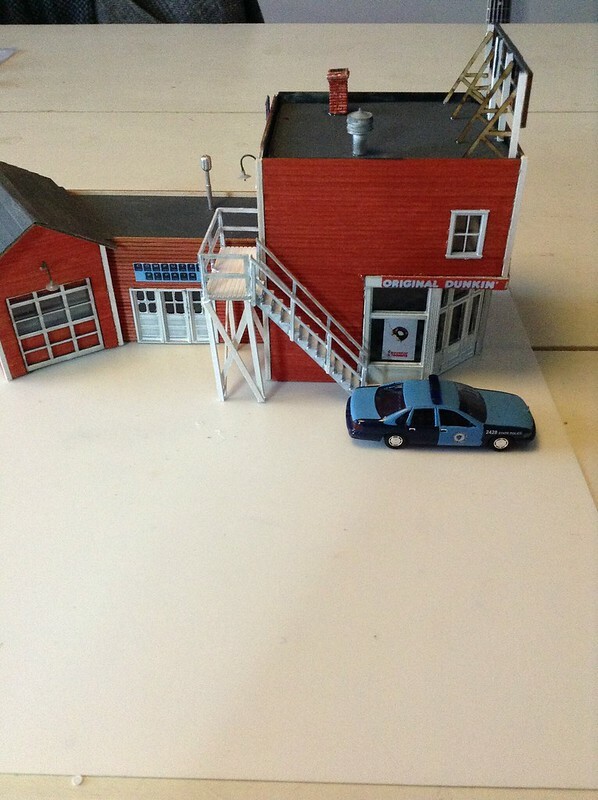 I then did the same for the extension and the garage/workshop building behind it. At this point it was time to stop and let everything dry again and admire the results so far. Moving not so swiftly on, this week I've completed the main structure , nearly. That is the roof is on, but it's not painted. The instructions call for painting it, I've decided I'm going to get some fine grit sandpaper and use that. 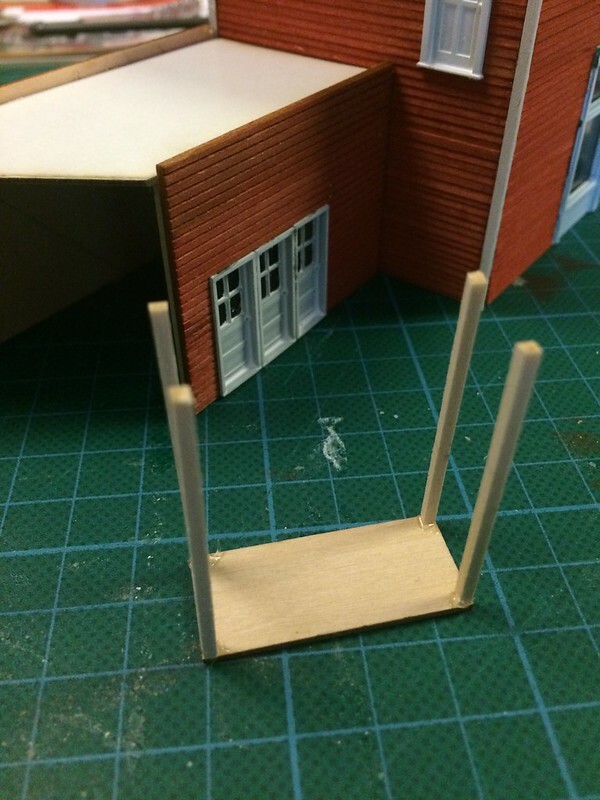 I am going to do the same to simulate the tar paper roof on the outbuilding, as I haven't got a grit size small enough for my liking, I stopped there, and turned my attention to the rear landing structure. That was the first of the possibly more fiddly constructions. Glad I have the NWSL chopper to get the legs exactly of the same length and square. There is no support for them on what is the landing floor. My glue choice seemed a godsend however, and using a tiny dab of it on each leg I was able to glue them to the four corners and let it dry. In the meantime I also removed the railings from their frame and glued them together. 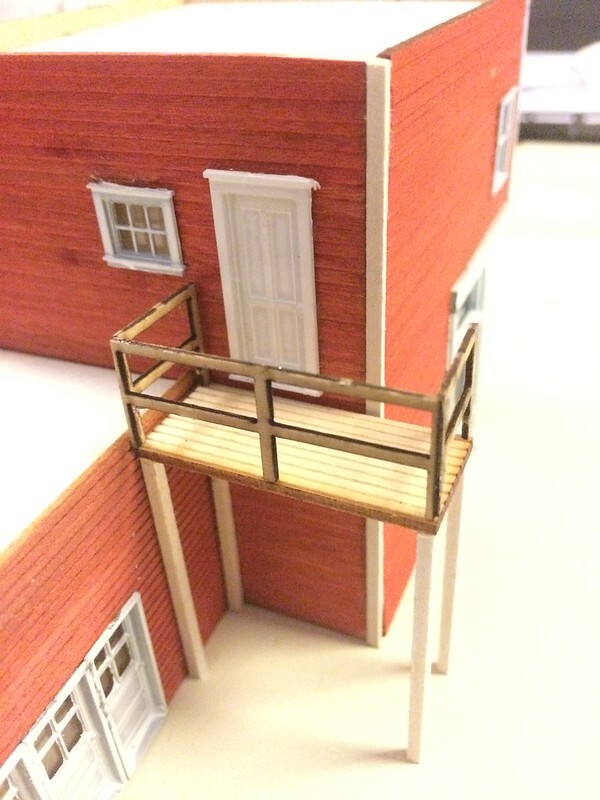 Also these were done with the same glue and a tiny dab of it to the bottom of the railing uprights applied, I stuck it to the landing floor. Next would be cross braces, which I did cut to length but too scared that I would disturb the assembly as it is before the glue sets completely, I will wait until tomorrow before I add these to the legs of this platform. 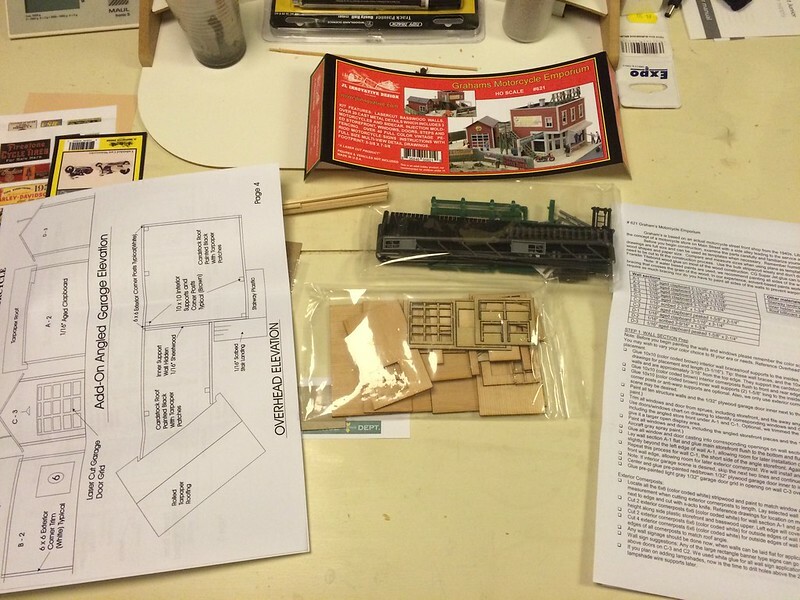 So here's a few pictures of the assembly and progress made. Pushing on a little this morning before going to work, I completed the ladder and support struts for the landing structure, so it has time to dry during the day. This will mean I should be able to paint it this evening. 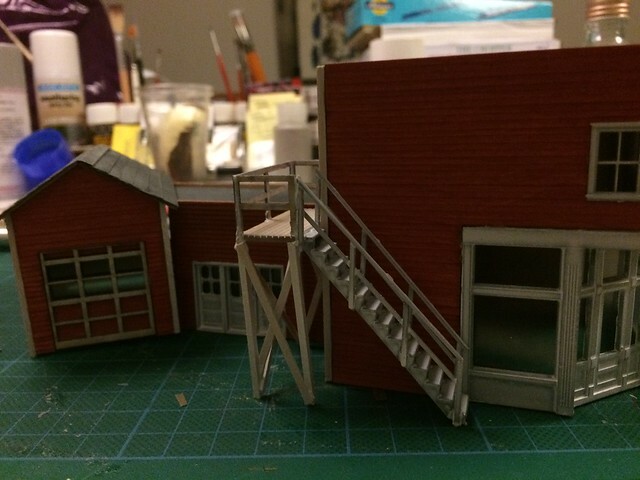 As expected I was able to put a first coat of paint on the stairs and landing structure. 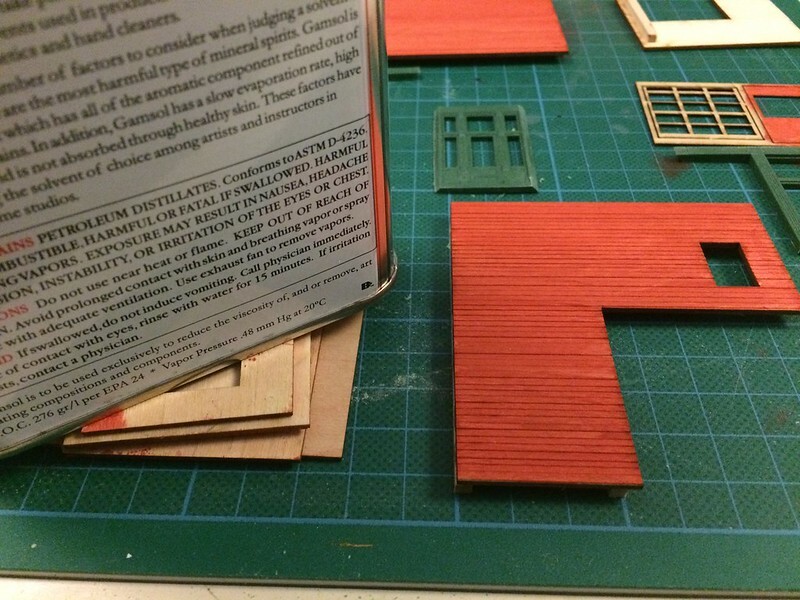 Earlier I mentioned that I wanted to use fine grit sand paper to simulate the roofing, instead of flat paint, as it would give it a little texture. I used 600 grit wet sand paper, cut these to size and glued this to both flat roofs. Next I used the same paper to cut strips, and glued this on the shed roof , slightly overlapping and have let it dry overnight. 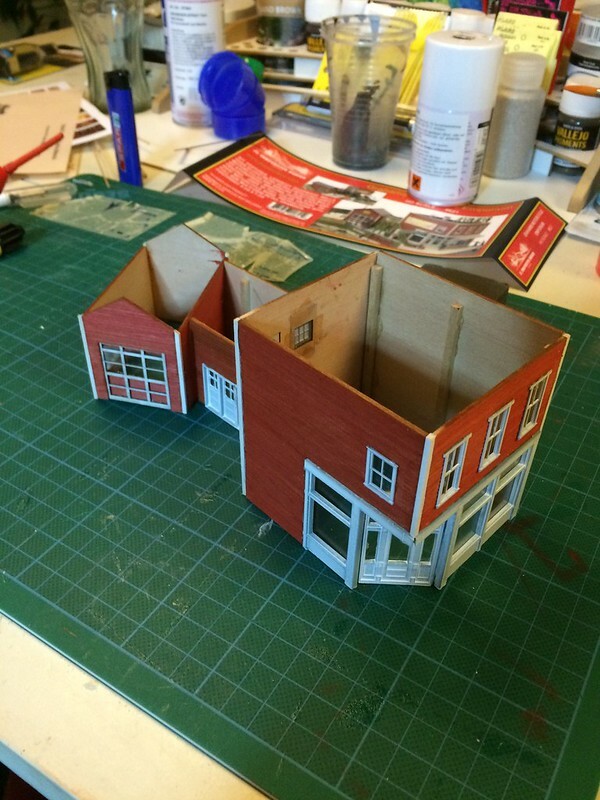 This now completes the assembly of the main items, and the tedious bits begin, details such as awnings , chimneys , lights and signs, as well as touch up paint in places, some weathering etc. The last week, and the last push to try and complete my model. First I decided to focus my attention to the interior. 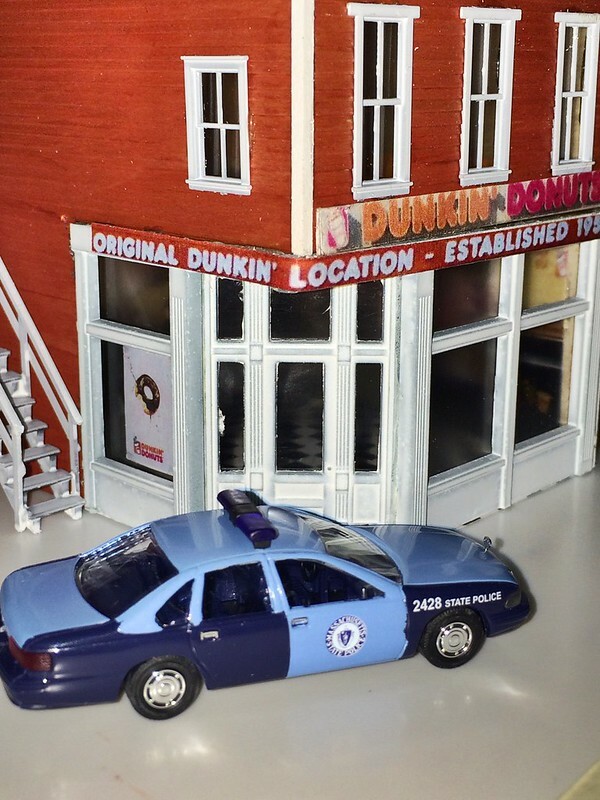 For now the building will remain unlit, but to prepare it for future lights I decided to add a basic interior. 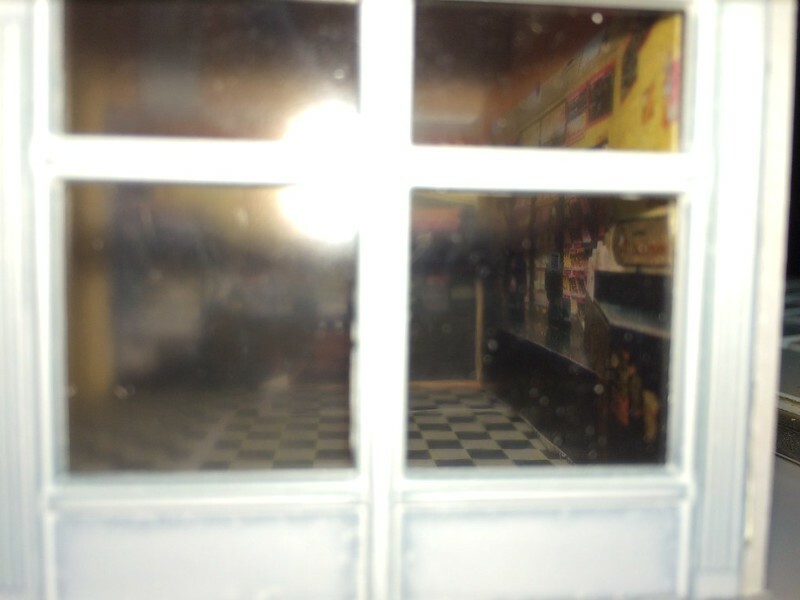 The interior elements added for now are photo 'walls'… I searched the internet for interior shots of a well known american chain and scaled them down as best I could and glued these to the interior, when viewed from the outside it immediately gives a sense of depth to the structure. I won't reveal just yet which chain it is, but I needed something that would set the building in more recent times, rather than the kit's original designation as a motorcycle shop, which was decidedly 'transition era'. 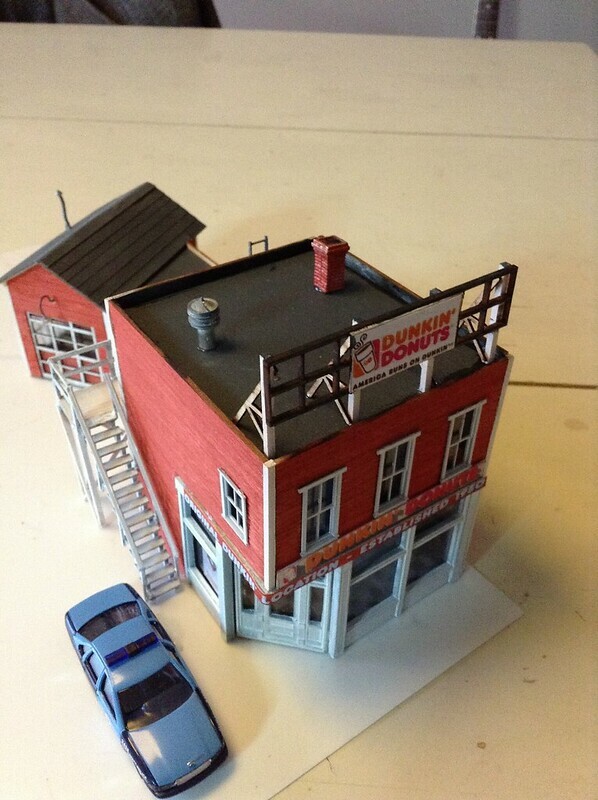 The first customers have already arrived before I've completed the building and it's fitted into the scenery. I had ordered some styrene sheets to use as a base and to be able to model a pavement, but they have been put on back order and won't be here before March 1st so I can't complete the structure 100%. 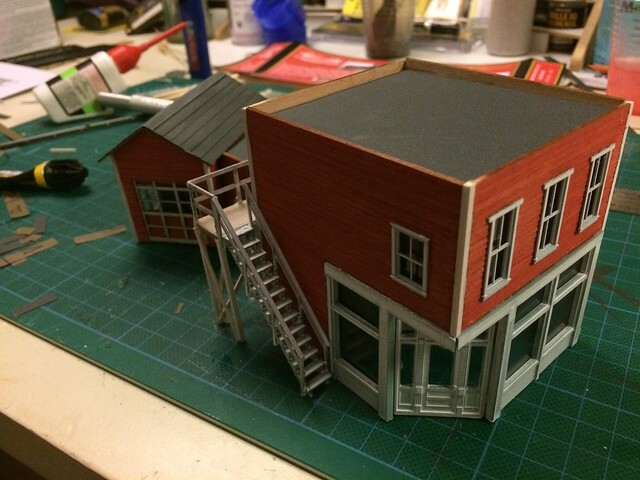 A little bit of additional signage and billboards still need to be added too, but I printed them out too large, so I will have to try again, hopefully I will manage to add that tomorrow and do some final touches to the structure as far as I can without the 'missing' items. 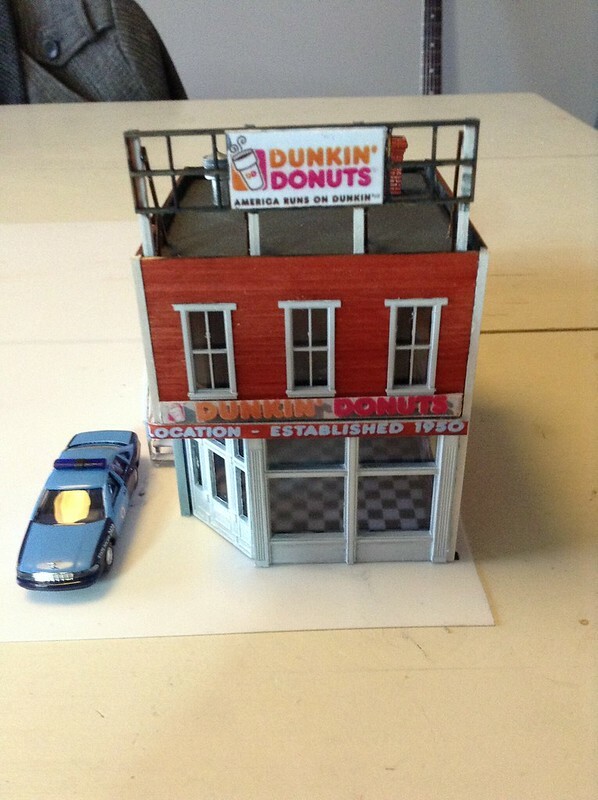 The Dunkin Donuts signs and posters were found on the internet and I've tried to scale them down as much as possible to fit the structure. Well as much as I could. I've decided not to weather the structure until it has found a place on my module, so I can blend it better with it's surroundings. The last billboards and posters etc have been fitted for now. It was fun doing a wood structure, my first, and I learned a few things along the way which is never a bad thing. I'm sure I'll do some more in the future. 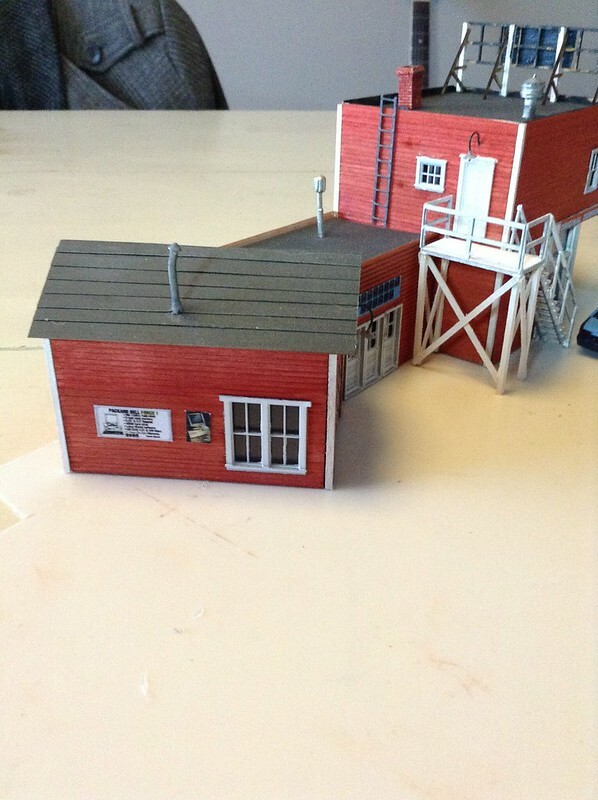 Hope you will have enjoyed following along with this build and perhaps it has convinced you to try something similar in the future, perhaps also in a Challenge like this?